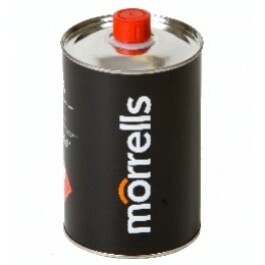 One litre tin of Morrells flooring oil - this will cover a approx 18 m2 applying one coat. Perfect for any number of tasks, types of wood or flooring such as oak flooring, oil is both quick and easy to apply and needs no special training or level of skill. Our natural floor oil can be applied to hard and soft wood flooring by paint brush, mohair roller or spray gun. Our floor oils are made with a blend of the finest ingredients, including Linseed Oil to create a product that is easy to apply with a natural horse hair paint brush, mohair roller or spray gun. It offers good durability against liquid spillages and offers some heat resistance. Our floor oils also contain anti slip properties and are ready for walking on within around 12 hours depending on the application and immediate environmental conditions. Lacquers (varnish) and paints are film forming and if damaged, or just old, can peel or flake. The benefit of Floor oils is that they do not form a seal on the surface, instead they penetrate deep into the surface grain therefore keeping the wood supple and making it strong at the same time. Natural floor oils will continue to soak through the surface grain so future applications will be necessary, further coats of floor oil will however improve the effect as time goes on. It is recommended that 2 or 3 coats of natural floor oil are initially applied, the frequency of subsequent coats depends on the density of the timber although a fresh coat of floor oil once or twice a year is a good guideline. Natural floor oils are perfect for all kinds of flooring including pine, oak flooring, mahogany and beech.